In this age of great cinematic ideas but scarce financial backing, Hungarian film makers often look back with wistful nostalgia to the 1940s - a golden age of Magyar cinema when such charismatic stars as Pál Jávor, Klári Tolnay and Zita Perczel graced the screen. One star who shone particularly brightly was Katalin Karády, a brilliant actress whose life matched many of her roles for drama and intensity. In 2001, director Péter Bacsó, maker of the wonderful satire 'A Tanú' (the Witness), shot the film, 'Hamvadó cigarettavég' (The Smoldering Cigarette End) in Budapest about the life of Karády and the interest in her career and life is as alive as ever. ‘It’s not a documentary, but a fictive work with history, tragedy and comedy. In fact, everything is in it,’ Bacsó said. Karády is remembered fondly in the winter months. Her birthday falls in early December and her name day on November 25. On both days, wreaths are placed beneath a plaque outside her flat on District V’s Nyáry Pál utca. During the 1956 Revolution, a fan placed a wreath of fresh fir branches and red carnations with a message which read, ‘Your soul lives forever’. Karády is remembered not only for her considerable thespian talent but also for her tremendous courage in standing up to oppressors. The plaque placed by the local government in 1991 on the wall of the now-faded Art Deco building reads, ‘In this building lived Katalin Karády (1912-1990), popular actress in many Hungarian films and protector of those persecuted in 1944’. During the Second World War, Karády owned three flats in and around Budapest and she used these places as refuges for Jewish friends to hide and escape the Nazi terror and deportation to death camps. In her autobiographical paperback, ‘Hogyan lettem színésznô?’ (How did I become an Actress? ), Karády wrote, ‘My frail constitution could not bear the fact that tens of thousands were being taken away in wagons to their deaths’. If they were arrested, she would go out to the detention centre at Kistarcsa and attempt to bring them back. Bacsó’s film honours her bravery and ends with a scene depicting how Karády was arrested in 1944 by the Gestapo while singing on the radio in her inimitable smoky voice. She was incarcerated, beaten and questioned for three months, but never gave in. During the 1940s, Karády made some 20 classic films, from period costume dramas like ‘Erzsébet királyné’ (Queen Elizabeth) to brooding mysteries such as ‘Valamit visz a víz’ (The Water Brings Something) in which the role gave opportunity for her to display her dangerous, sensual intensity. 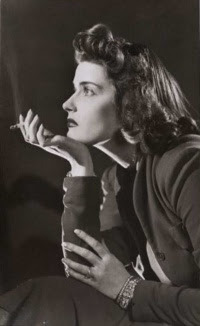 Karády was compared to everyone from Rita Hayworth to Barbara Stanwick, Jane Russell to Greta Garbo, although she had a personality all her own and with her square jawline and determined character, could compete with Hollywood’s best. It seemed there was no role she couldn’t play, from the suicidal rejected lover in ‘Ne kérdezd, ki voltam’ (Don’t Ask Who I Was) to the spoiled, disturbed maiden in ‘A szûz és a gödölye’ (the Virgin and the Kid Goat) or the faithful wife who turns vivacious vamp in ‘Alkalom’ (Occasion). Karády’s humble childhood in the capital’s outer district of Kôbánya hardly gave clues as to the stage and screen actress of stature she was to become. Her strict father often used his belt or his fists on Karády and her six older siblings and forbade visits to the cinema or theatre. Karády’s early appearance also gave little hints of the stunning, smouldering beauty which would emerge from the chrysalis. ‘How was I? Like all premature babies: Puny, weak, sickly in appearance, stunted in growth,’ wrote Karády . One aunt took a look at her and said cruelly, ‘Well, it will sure be difficult to find a husband for Kati without paying’. However, by her teens Karády had blossomed with a natural, compelling charisma which never faded, even after she emigrated to Brazil in 1951 and from there to New York in 1977, where she made hats and lived until her death in 1990. By the age of 14, Karády had developed a passion for clothes and with her slim, big-boned figure could wear them with panache. A decisive moment came when she recited the ‘Little Cripple’ verse in front of her first significant audience and it was a success. She wrote, ‘I felt this was my chosen path. They listened to me, they watched me, I am the centre’. Karády dropped out of her second year of high school at 16 and married a much older man, but the marriage quickly floundered. However, she appeared on the Vígszínház theatre stage in Budapest and soon attracted a host of admirers, for her personality as well as her acting abilities. In 1939, Karády made her first film, ‘Halálos tavasz’ (Lethal Spring), and became an overnight star. She attracted attention with her alternative lifestyle, threw great parties and was rarely seen without a cigarette between her full lips. The title of ‘Hamvadó cigarettavég’, with Eszter Nagy Kállóczy in the leading role, is taken from one of Karády’s songs, performed in her husky voice. The Gestapo arrested Karády on April 18, 1944, allegedly for her relationships with Colonel Újszászy, played in the new film by popular actor György Cserhalmi. Karády had been attacked in the press for her ‘liberalism’ and she even wondered if the authorities had confused her with one of her roles - she played a Magyar Mata Hari in the 1943 film ‘Machita’. In prison, Karády was beaten severely and was not released until late summer. After the war, Karády made only one more film, ‘Forró mezôk’ (Hot Meadows), in 1948 and, three years later, she left Hungary. Katalin Karády died on 8 February 1990 and her ashes were brought back to Budapest a year later. She lies in the artists’ plot in Farkasréti cemetery. In 2004, Katalin Karády received the posthumour Righteous medal from the Yad Vashem Institute in recognition of her courageous acts during World War II. Karády’s films are often shown on Hungarian television and videos of her work can be rented from Odeon film outlets in Budapest. Bacsó’s docu-drama, which showed in cinemas in 2001, introduced a new generation to her electrifying presence: A consummate actress, a powerful personality and a very brave human being.